Finished Apr 2018. Final score: 5 / 5. I wanted some sci-fi, and this book was well reviewed. This is a humorous fast-moving sci-fi adventure that I really enjoyed. I really liked this book. Where to begin? First major point: this is genuine sci-fi. There is space travel, there are aliens, there is warp travel, there are space pirates, there is a living pile of goo. All the ingredients for a nice adventure is present. To glue the plot together, we have Cal, the main character, full of arrogance, a touch of charm, and takes nothing seriously. Second major point: there is actually decent humor. I never quite enjoyed the humor in The Hitchhiker's Guide to the Galaxy. I liked the humor in this book. I actually chuckled out loud a few times. A major problem I had with HHGTG is that the humor just seemed randomness for the sake of randomness. The amusement in Space Team is woven directly in to the plot. The book is funny because the situation Cal finds himself in is funny, and he frequently just makes things worse. The plot moves at a good fast speed. While HHGTG was full of (admittedly decent) detours, Space Team's characters happen upon amusing encounter upon amusing encounter. All these encounters fit into the overall goal of the book. I'm trying very hard to not give spoilers with this review, so I will tread carefully. More positives: While you can sense a touch of tension, there is not a needless love story. You know if this book is ever made in to a movie, the studios are going to make Cal and Lauren a couple (like they did with Petra and Ender in the terrible Ender's Game movie). Blech. Not needed. This book was a hapless crew doing sci-fi things. They are held together by edict, then convenience, and finally self respect. Big negative: I am not a fan of the big apology speech at the end of a story. Think of essentially every episode of Family Guy: Peter acts selfish, causes a bunch of trouble, and then gives a public heartfelt "I'm sorry" speech at the end. I don't mind ruining this piece of the ending because Cal's speech was highly predictable and fairly painful to read. Find a better way to resolve that conflict. Taking the book as a whole, I'm giving it my highest rating: 5/5. Though I am undecided about diving in to book 2, book 1 is well worth your time. It is very enjoyable. All the major plot points of book 1 were decently closed. 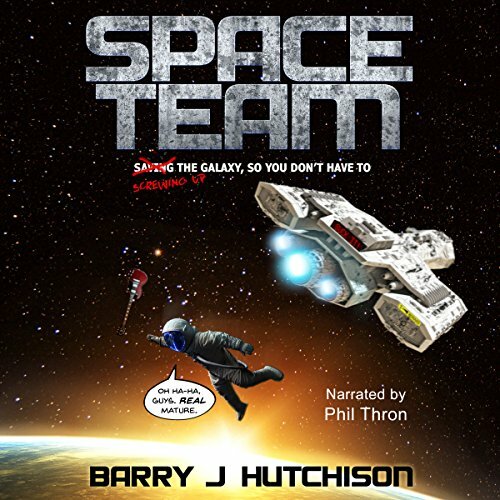 Discuss Space Team (Book 1) in the forums.